“I am your cat, you are my person. I can’t remember a time when you weren’t there. When you adopted me, I was so happy that someone loved me enough to take care of me my WHOLE life. That’s a BIG commitment, but you seemed sure, so I was sure too. You promised me that you’d keep me safe, and take care of me to the best of your ability, always. Now, I’ve become attached. I love you more than I love myself. I can’t imagine my life without you. I love the way you smell, I love the way you talk to me, and I love our routines. Every morning, you feed me, I follow you to the shower so I can play with the water, I sit next to you while you eat breakfast and then I (sadly) watch you go to work. I wait in the window, watching birds while I anxiously await your arrival back home. I look forward to cuddling up next to you each night, to make sure you are warm, and I purr my soft purrs to soothe you to sleep. I love you. So, Are you coming back? Because today was like any other day until you brought me on a car ride, and left me here in this strange place. I heard you say something about moving. Will you come back when the new place is ready for me? This place doesn’t smell right, and this food doesn’t taste the same. Who is going to sleep with me tonight?! Other humans are trying to pet me. They say “It’s okay,” but it is NOT okay. They don’t understand, and I can’t tell them that I’m worried! My human is MISSING! Is my human okay? I hiss at them, and try to bite them. I’m so scared. Why haven’t you come back yet? Another cat is growling at me…. what if it hurts me? I don’t know how to fight! Traumatized by the move? Please…. I won’t be traumatized….please…come back. As long as I have you by my side, I will be okay! I’m traumatized HERE in this place! I hear them say that there are plenty of other apartments we could have gone to. You just didn’t take the time to look. Why did you choose to leave me behind? I didn’t matter to you? My heart is breaking. I spent my whole life thinking the world of you, not knowing that I was a disposable item. Please do everything in your power to be responsible pet owners. We understand that in some cases, it is not possible for a cat to move with you – like to nursing homes, assisted living facilities, and active duty. Moving? Here are some other issues that come up, and how you can solve them. Long Distance Moves: Prep your pet by making their carrier a comfortable place. Add shirts that smell like you, & favorite toys. Give them treats when they approach the carrier. Try taking a few short trips in the car with the carrier, and gradually transition to longer trips. If you have a really anxious pet, ask your veterinarian about calming medication, or Feliway, just for the trip! Flying: Many airlines now allow cats to ride in the cabin with you. Driving: Play soothing music, or download some bird videos on an iPad! Overnight stays: There are PLENTY of pet friendly hotels. Plan your stops in advance, and traveling with a pet is no problem! “My cat will be traumatized!” – To this I have to say, your cat will certainly be more traumatized in a shelter. Every move requires an adjustment period, but if you put effort into ensuring your cats comfort, you’ll be okay. Add Feliway diffusers to the new place. Start off by allowing them to explore one room, and gradually open more and more doors. If you’re bringing all of your stuff with you, chances are the new place will begin to have a familiar smell right away. Unpack and get settled in as soon as possible. They’ll like to see and smell familiar items around the household. BE THERE for them, and be calm! If you’re anxious, they’ll be anxious. You’re their rock. Remember that. “I can’t find an apartment that allows cats.” – There are SOME cases where you really can’t! Maybe you don’t drive, and you need to move to an apartment close to your place of employment …but none of them allow pets! And that’s okay. In scenarios like that, please know that we will all do our very best to help your cat adjust to the loss of its owner. In most cases, though, you need to look harder. 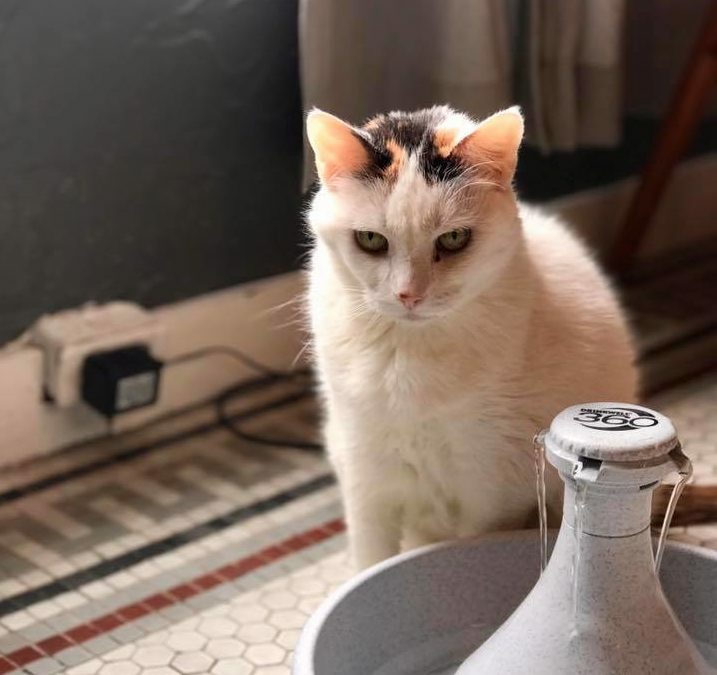 It’s becoming more common for rentals to allow pets, and as a pet owner, it is your responsibility to search your very hardest. If you can’t find something ask Google, ask a friend, ask the city! Until you’ve exhausted ALL options, do not surrender your pet for this reason. If you are using “moving” as an excuse to get rid of a cat you no longer want to be responsible for (yes, a LOT of people do this). We’d rather you be honest. We’ll gladly help your cat find new, loving owners! 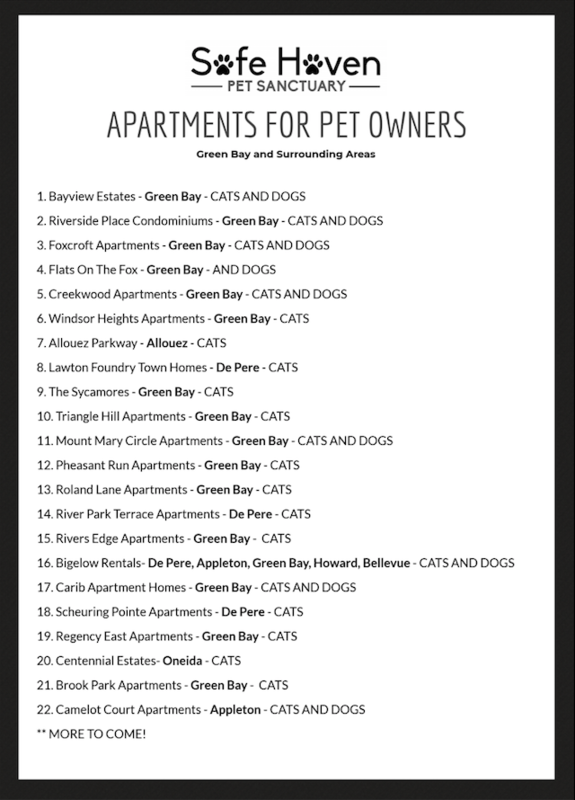 On that note, here is a list of apartments in our area that DO allow cats. Some also allow dogs! Please use this list, and share this as you see fit.